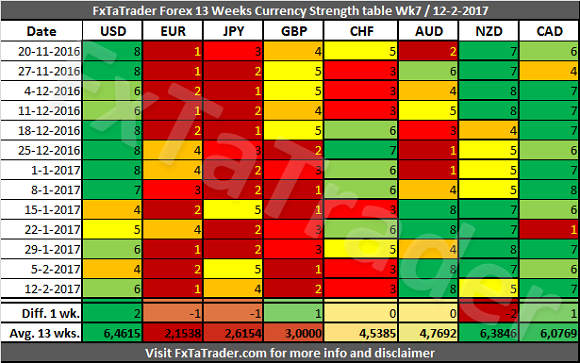 In the Currency Strength table the AUD was again the strongest currency while the EUR was the weakest. The USD gained 2 points last week and the NZD lost 2. All the other Currencies remained around the level of the previous week with a maximum difference of just 1 point. Strong: USD, NZD, CAD. The preferred range is from 6 to 8. Neutral: CHF, AUD. The preferred range is from 4 to 5. Weak: JPY, EUR, GBP. The preferred range is from 1 to 3. When looking at the Average 13 wks. Score the USD remains the strongest of all while the EUR remains the weakest. The currencies are grouped together around a level which makes clear to what classification they fit best. The CAD has become a Strong currency because of the good performance lately. 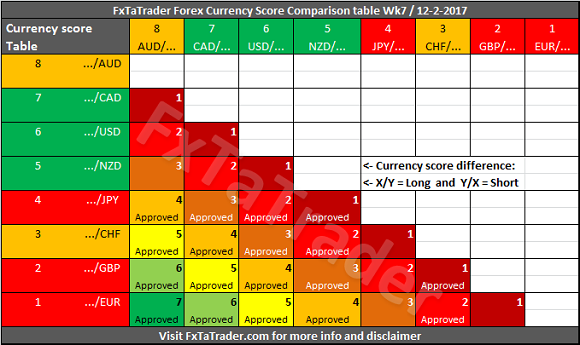 In the last 13 weeks it had 7 times a higher Score compared to the USD which is also a strong currency. The CAD is back at the high levels after having a dip in week 4 with a Score of 1. This currency is now classified as a strong currency. 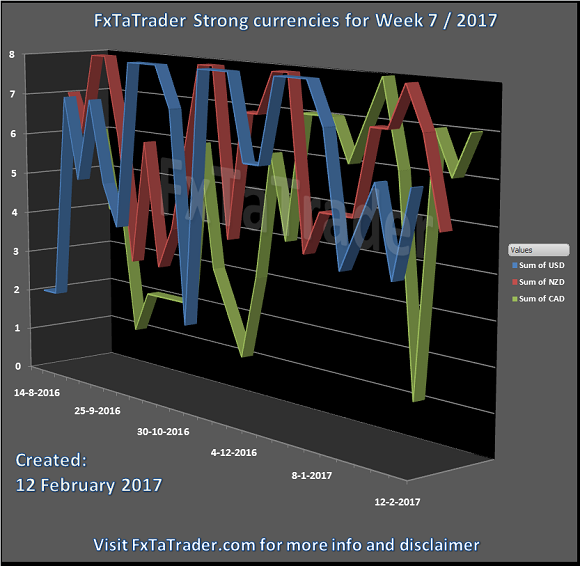 The other strong currencies are doing well also except for last week where the currencies are on the lower side of the range for Strong currencies.Below you can see the Weekly Currency Score Chart with the 6 months data as a reference. Some of the pairs in the "Currency Comparison Table" comply for a longer term trade based on the Technical Analysis (TA) of the Daily and Weekly chart. For the coming week these seem to be: GBP/AUD, EUR/AUD, GBP/CAD, EUR/CAD, AUD/CHF, AUD/JPY and CAD/CHF.